From the tight opening shot of a black sky obscured by the masked faces of sweating men boiling, mixing and pouring meth in the middle of the dessert viewers will fall deeply into the complex world of Cartel Land. “We know we do harm but what are we going to do?” One of the drug makers explains that the deadly combination of his poverty and the demand for drugs is what has forced his hand. Written, produced, edited and directed by Matthew Heineman, this deftly filmed and edited documentary masterpiece follows two vigilante groups and courageously presents all perspectives on their choices. Are they heroes? Are they accelerating the drug and immigration problems? Is their work more about their personal egos than making a difference? Maybe all are true. The viewer is left to sift through the myriad information and make their own conclusions. One vigilante is Dr. Jose Mireles, known as “El Doctor.” He is fed up with living in fear of the powerful and violent Knight Templar drug cartel and creates a group of citizens in the community to fight back. The group is named Autodefensas and begins with a small handful of men and their weapons. They hunt down men they know are in the cartel and murder them or chase them out of town. Once one community is cleared they continue on in hopes of clearing all of Michoacán, Mexico, from the cartel. The group and the egos of the leaders of Autodefenses grow and intensify until the government feels that they must intercede. “We can escape the Templars but we can’t escape the government.” Mireles is a larger then life character. His height literally makes him rise above his people but his performance as family-man and every-man seduces even the most hesitant townsfolk. 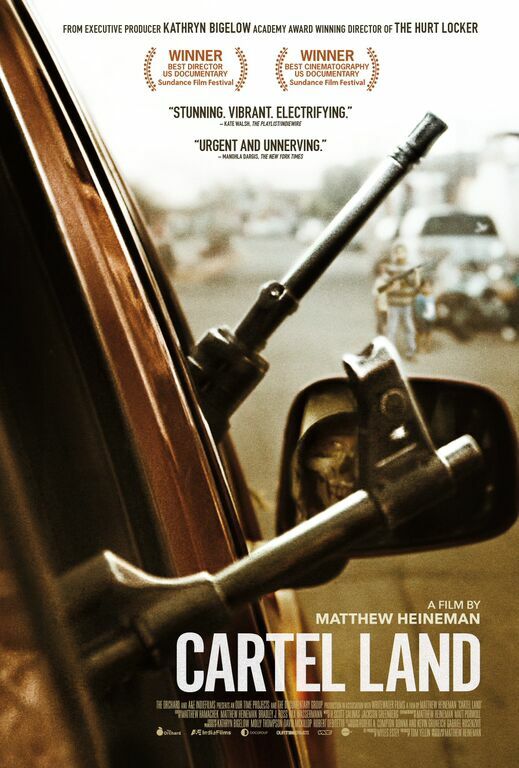 Heineman catches some incredibly emotional and graphic moments of cartel produced violence. One of the most emotionally grueling scenes occurs during a family funeral. The family were lime pickers and their boss didn’t have the money that he owed to the cartel. To punish him they brutally slaughtered his workers. 13 of them were in one family. They lost mothers, uncles, children, lovers. The gut wretching screams of the women paralyizes funeral attendees. Some of the graphic images include beheaded bodies and heads, hanging bodies and beatings. The unraveling of the two vigilante groups, particularly that of the Autodefensas , is as exhilarating as any adventure film and the incredible level of tension that the filmmaker holds throughout is reminiscent of some of the best American documentaries ever made. This is quite simply, one of the best films of the year.